This itinerary is an in-depth exploration of the culture, people and landscapes of northern Vietnam. Beginning with the classic highlights of Hanoi and nearby Halong Bay, travelers then venture north, into the highlands that are home to hundreds of villages of northern minority hill tribes. These villages each boast their own culture and language, and many do not even speak Vietnamese. These villages, their close proximity to China, and the resulting cultural melding, are integral to understanding both ancient and modern Vietnam. Vietnam's capital is rich in a culture touched by French and Chinese influences over its 1,000-year-long history. One can spend days in the Old Quarter, where fashion houses, art galleries and coffee shops make up the city's most charismatic district. Hanoi features hundreds of serene lakes, great for people watching and strolling an afternoon away. Take an evening to dine at a modern, cosmopolitan restaurant and enjoy a night on the town, but don't forget to take an evening to enjoy the thriving street food scene, one of the city's primary attractions. Today, you are invited to enjoy a truly local experience in Hanoi. One of Vietnam's common cultural practices is to wake up early in the morning and start your day with some exercise. If you want, you may embrace this tradition and join the locals in their Tai Chi and aerobics practice. After warming up, your tour continues with a visit to Ngoc Son Temple, located in the middle of Hoan Kiem Lake. From there, you will be taken to a traditional coffee shop, where you can try the classic iced coffee, or an egg coffee, for those feeling more adventurous! Of course, you will also have to try a local street food favorite, banh mi. This typical baguette sandwich is filled with a delicious variety of local ingredients. After sampling some of the common cuisine, you will follow your guide deeper into Hanoi’s Old Quarter. Admire the impressive French architecture and unique Vietnamese buildings, en route to St. Josephs Cathedral, a French gothic building constructed in 1886. From there, you will continue to Hoa Lo Prison, where Vietnamese, American and French prisoners of war used to be imprisoned. Huu Tiep Lake will be your next stop, better known as "B-52 Lake", where US B-52 bomber wreckage can be seen. This morning, you will leave for Ha Long Bay, one of the most spectacular UNESCO World Heritage Areas and the world’s largest marine limestone ‘karst’ landscape. For your Ha Long Bay excursion, you will board the beautiful Athena Luxury Cruise boat. After a brief introduction and safety procedures overview, you'll be checked into your cabin and have some free time to relax and explore the craft. Seemingly infinite, the towering islands of Ha Long Bay form a landscape that is other worldly. 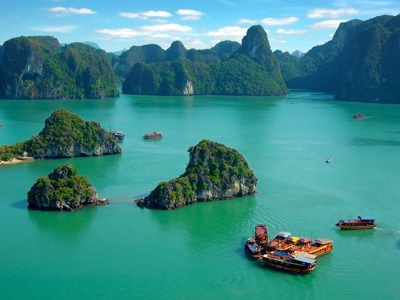 Named a World Heritage site in 1994, Ha Long Bay offers some of the most beautiful scenes in all of Asia, whether you are lounging on a beach, exploring the inside of a hidden cave or cruising along the water in your traditional Chinese junk style boat. Located just a few hours outside of Hanoi, you can easily trade in the crowded streets of the city, to sail between the striking karst formations instead. Ha Long Bay means "Bay of the Descending Dragons" and mythology says the islands were created from the jewels and jade dropped from the mouth of dragons sent by the Gods. No wonder it's so magical! Wake up this morning among the crisp and fresh air of the bay and make the most of any time left for activities. After enjoying a tea break, the boat will continue to cruise quietly through spectacular limestone formations, in more isolated regions of the bay for spectacular viewpoints. You will return to the Ha Long Bay Harbor around 11:00 AM, from where you will be transferred back to Hanoi. You’ll arrive in the early morning, where you’ll be met and taken by car to visit a market frequented by ethnic minority peoples. After a picnic lunch, you’ll return to Lao Cai and continue your journey into the mountains to Sapa, a small town perched on the mountainside opposite Mt. Fan Si Pan, Vietnam’s highest peak. You’ll arrive with time to relax and stroll around the town. You’ll spend the night in a Sapa hotel with good mountain views. Although it’s quite a long drive, the landscape is attractive and the ethnic markets are a fascinating experience. Unlike those in the tourist areas, the markets that we choose are for not only for buying and selling, but are also meeting places for ethnic minority people to meet and exchange news. There will be plenty of color and authentic costumes, but very little to buy as souvenirs unless you want to barter for a water buffalo or a sack of fertilizer! The trips to ethnic minority markets must be on Tuesday (Coc Ly or Ban Cam market), Thursday (Lung Khau Nhin market), Saturday (Can Cau) or Sunday (Bac Ha, Muong Hum or Muong Khuong markets). 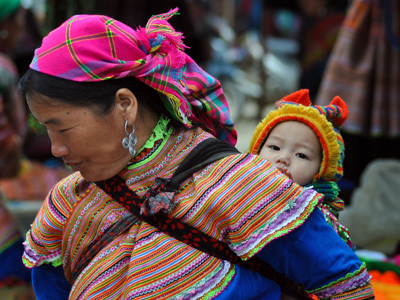 There is something about Sapa that defines itself as undeniably Vietnamese. The rolling valleys, rice terraces, minority hill tribes, and stilted buildings are the image many people conjure when they think of this otherwise modern country. Sapa is where the countryside is still alive and thriving. Opportunities for trekking abound, and interacting with the fascinating locals is the main activity in this remote place. After breakfast, you will head off into the beautiful Hoang Lien National Park by car, along the road you have the chance to see big rice terraces and a hopefully the high tops of the mountain range. Soon your guide will introduce you to the biggest group of minorities in this area, the Tay and Red Dao people. The walk is on a good path and will take few hours, plenty of time to learn about history and traditional customs. You will then continue the transfer deeper into the valley and cross the beautiful Muong Bo River before reaching Thanh Phu village of Tay minority. Here you will see the big difference in culture as the group wears lighter colors of silk clothing. Your picnic lunch will be served along the way, next to the rice fields. In the afternoon you will arrive in the remote and quiet Red Dao village of Nam Cang. Walking along the small roads you will soon understand that this is “off the beaten trail”, people are looking happily. 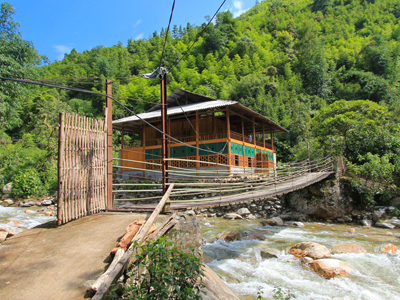 Finally you will cross a private bridge and check into your private room in the comfortable Topas Riverside lodge. You can now explore the village or relax in the river or at the riverside veranda. This morning you will drive to My Son village. Inhabited by one of the smallest ethnic groups in the mountains of northern Vietnam, the Xa Pho people, My Son village is a glimpse into the simple life of these rural people. You will notice women working on embroidery projects together, while men are hunting and collecting firewood. Continue on a trail following the river and cross a suspension bridge to Nam Toong village, a home to the Red Dao people. Take time to enjoy the magnificent mountain and rice terrace views along the way, as you walk to Ban Ho village. Enjoy a delicious local lunch with a family of Tay people in their stilted house. Spend some time exploring the village or take a swim at Lavie waterfall before you are returned to Lao Cai for your night train back to Hanoi. Here you will board your overnight train back to Hanoi. You will arrive in Hanoi in the early morning and be transferred directly to the airport for your morning flight to Hue. Breakfast will be on your own account (there are many restaurants at the airport). When you arrive in Hue, you’ll be met by our guide and driven to your hotel to leave your luggage (note: check-in time after 2:00 PM, early check-in dependent upon availability). 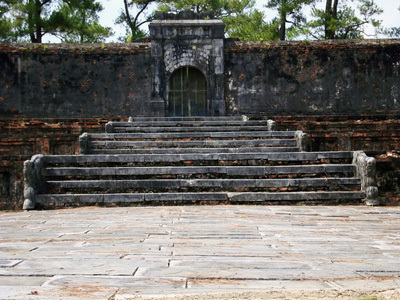 The heart of imperial Vietnam's history, Hue is Vietnam's cultural capital. It's architecture calls back to a time when the Nguyen Dynasty built temples, pagodas and palaces across its landscapes. A calm, noble city lives on today, showcasing beautiful buildings that survived bombings during the American War. The easy-going local crowd enjoys a night out, and routinely interacts with foreigners. With a tradition for maintaining authentic recipes, Hue's chefs might be the best example of pure Vietnamese food that dates back to the country's imperial years. 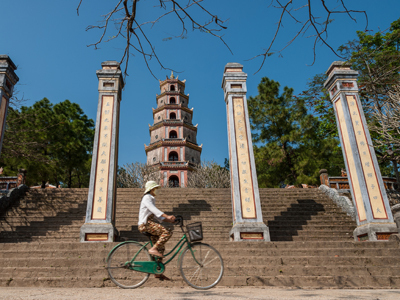 This morning you will make your way to Thanh Toan - an ancient village founded in the 17th century, this peaceful countryside gives you a true sense of rural Vietnamese life. Observe traditional farming practices, explore the rural market and shrine houses. 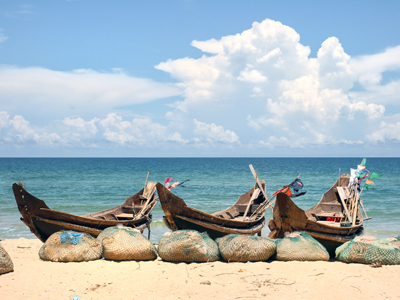 Hop on a sampan and go fishing using traditional techniques. Hang out like a local on the tile roofed bridge and listen to the locals chatting or chanting folklore verses on this delightful off the beaten track experience. In the morning, your car will drive you to Danang. On the way, you'll cross the Hai Van mountain pass. The views from the top are excellent – you should be able to see Lang Co beach and village, and the lagoon far below, with Danang spread out before you to the south. Arrive in Hoi An for overnight. 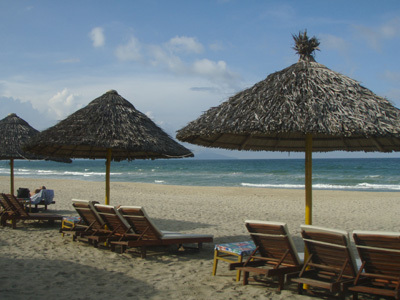 There is a reason we encourage first time travelers to Vietnam to visit Hoi An. Following the hustle and bustle of the bigger cities, travel in Hoi An feels effortless. There is little modern motor traffic, and the shops and restaurants are mainly tailored for tourists. A romantic cafe culture is featured in French colonial buildings, along with a thriving art scene, that can keep you busy shopping for days. Hoi An is also a great base from which to enjoy a couple of beach days, or to venture inland for a cultural experience with local farmers. This morning, you will be transferred to the airport in good time to board your flight home. 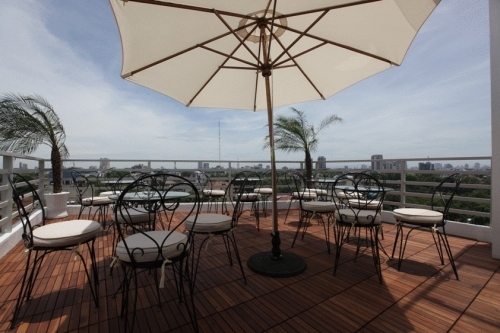 Opened in May 2010, the well-known Hanoi Elegance Diamond Hotel is perfectly located in Hanoi’s historic Old Quarter, just a 2-minute walk from Hoan Kiem Lake (the Sword Lake). The hotel is perfect for value-conscious travelers, with a great location, nice clean rooms, and good service. The Athena Cruise is the brand new five-star luxury cruise vessel in Ha Long Bay – Bai Tu Long Bay. Built in 2016, the Athena Cruise made her maiden voyage on July 1st, 2017. The ship has 3 decks: a lower deck with reception, cabins, and boarding area, a middle deck with cabins, an indoor restaurant and bar, and a rooftop sundeck with open bar, coffee lounge, spa and sauna. On board the Athena Cruise there are 21 high-end cabins with 5 different styles available to custom-tailor your voyage with us. Our journey from the legendary Ha Long Bay to the less-traveled Bai Tu Long Bay will give you a unique experience that other cruises do not offer. On the Athena Cruise you will find yourself surrounded by natural beauty and captivated by the mysterious, ancient, natural wonder of Ha Long Bay. Our friendly and professional staff and crew are dedicated to your safety and enjoyment. We are available 24 hours a day to deliver to you the most luxurious and enjoyable experience on our ship. Whether you seek adventure, luxury, romance, or relaxation, the Athena Cruise will give you the experience of a lifetime. With its elegant carriages, the Victoria Express Train recalls a more romantic era. 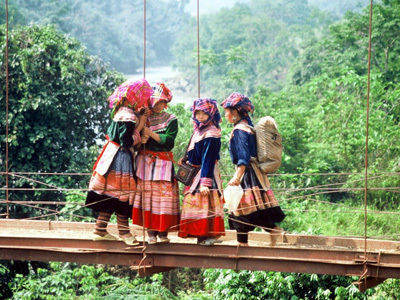 Passing through the exotic landscapes of North Vietnam, it offers every visitor a wonderful travelling experience. Indulge yourself in our dining carriage, “Le Tonkin”, where you can savor the delights of traditional Vietnamese and Western cuisine. Our talented Chef has selected the best wines, adding a further exquisite touch to a memorable experience. Discover our 4-course set menus! The train departs six times a week, linking Hanoi to Lao Cai. 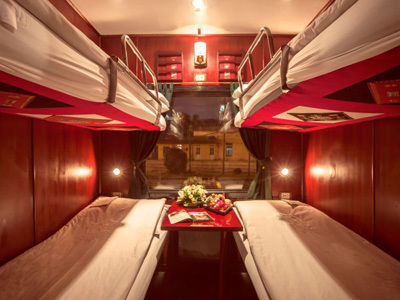 The Victoria Express Train is a 8.5 hour trip from Hanoi to Lao Cai, accommodating up to 52 passengers in two luxurious sleeping carriages. Each sleeping carriage has 6 superior cabins (4 berths) and 1 deluxe cabin (2 berths), all are air-conditioned, wood paneled, with individual reading lights, baggage storage and oversized windows. Built as a traditional mountain chalet with accented wooden décor and a welcoming stone fireplace, The Victoria Sapa Resort & Spa overlooks the village, blending perfectly with the natural surroundings. The Victoria features 77 stylishly designed rooms, each with private terrace, wood flooring and a warm touch of local decoration. Guests will feel at ease in the “mountain chalet” atmosphere. 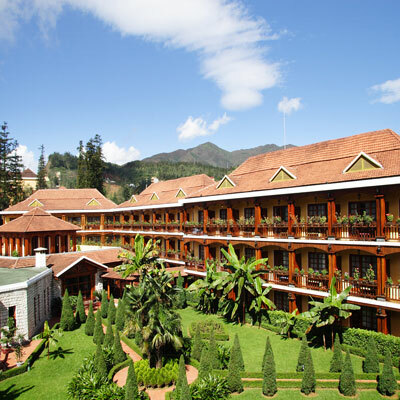 All guest rooms offer views over Sapa village, the resort’s lush gardens or Mount Fansipan. After an exciting day of sightseeing, refresh your soul and body with a revitalizing spa experience. Full resort facilities include swimming pool, spa, tennis courts, games room and fitness center. Located deep in the remote Sapa Valley with a beautiful river running in front of the house and green forest just behind you don’t find a better location for staying overnight in an old traditional minority village, in the heart of the Vietnamese mountains. This new house is built and owned by a Red Dao minority family. The area is brand new to visitors so prepare to witness the real and remote Vietnam when we go beyond the normal tourist routes, the surprised but friendly looks of local minority people, the children who swim in the river next to your house and to be welcomed to private homes as the local mountainous hospitality is unique. We hope you would like to share our interest in unique experiences and welcome you a remote stay but in comfortable rooms combined with good food and service . We believe at ÊMM you shouldn’t have to pay a fortune for a clean, comfortable hotel room and warm, friendly customer service. Centrally located in most of Vietnam’s top destinations just steps away from must-see city highlights, our properties feature bold colors and clean lines yet are always comfortable and affordable, promises you the home-away-from-home in all over Viet Nam whether travelling for business or pleasure. Overlooking the historic Hoi An ancient town, Laluna Hoi An Riverside Hotel brings the charm of Hoi An’s heritage & culture inside our doors. The hotel offers its guests a holiday full of relaxation, an unparalleled level of comfort and dignified service as well as gourmet dining options at the heart of Hoi An ancient town. Book your stay at Laluna Hoi An Riverside Hotel for the ultimate relaxed and personalized luxury. Whatever you’ll be here for, we’ll make your stay in Hoi An a memorable one.